I think Stine says it all. Writers by definition write. And it’s better not to focus on the how of becoming a writer, and instead, like Stine suggests, focusing on the doing. Writers write, lawyers practice law and actors act. Mind you, there is no rule that states that you must be exceptional at law to practice law or be outstanding at acting to act, and the same logic applies to writing. Yet, like any other profession, the more you practice, the more prolific you become. Author Ray Bradbury said, “Just write every day of your life. Read intensely. Then see what happens. Most of my friends who are put on that diet have very pleasant careers.” Bradbury is not the only one who thinks that way. 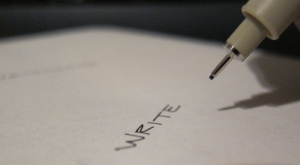 Actually, the most common advice given to “aspiring writers” is to write every day. I myself will have to follow that advice if I’m to complete my main goal for 2013: writing a novel in a year or less. It started with an idea, but this time instead of merely developing an idea and never really seeing it through, I vow to see this project from the beginning to its completion. Mark my words Bradbury: I will write every day. And some days, I will re-write. I’m totally excited, not only about writing my novel, but also that just in a few days I will begin blogging about this new writing adventure right here on VeronicaLouis.com. I’m looking forward to sharing my process, my struggles, my victories and so on. It’s amazing how one person can grow a whole universe from the seed of an idea. Let it be Tolkien or Rowling… their fantastical worlds stemmed from mere ideas. And I am looking forward to creating my own universe. And to think that all I gotta do is write!